My 2010 27″ 1TB iMac ran out of disk space because of the video content I was creating. Despite Apple’s best effort to limit my upgrade options I manage to upgrade it to include a 250GB Solid Sate Drive (SSD) plus a 2TB Hard Disk Drive (HDD) and get my system back to its last working state but with lots more disk space and much faster boot and application load times. Plenty of gotcha’s along the way – I had to work out and do a few ad-hoc adaptations. I cover new disk preparation, computer tear down, SATA adaptation, HDD temperature sensor hack and data moving, and data and account recovery. This is the longest video and the longest blog article I have written to date, and thats reflective of how much there is to cover – is not a simple task. I removed a Seagate Barracuda 7200 1TB drive which is still in working condition, despite being one of the drives on a recall by Apple. They offered to replace the drive some time back but I refused as it was inconvenient to be without my computer for a week, let alone the hassle of taking it to and collecting it from an apple store. I installed the following components. The 2TB drive was a perfect physical fit but did not have a compatible on board temperature sensor so I had to fashion one from a transistor, I used a TO-92 2N2907 and used the base-emiter junction as a silicone temperature sensor. The SSD drive had to be installed with double-sided tape but being so small and light this was the best solution. The whole modification to the computer is 100% reversible. The following outlines the various commands and steps I took to make this work. I am not saying this is either the only way or the right way, its the way I used and it worked for me. The most important thing I wanted to achieve was to preserve all of my data and never have a single point of failure for my data throughout the entire procedure. The computer is in a working state. Ensure the current system has *all* software and OS updates applied. Choose “Ignore” when you are prompted to initialise the disk you just connected. During the installation it will want you to create the administration account, call this “Admin” or something else you do not already have on your current system. Don’t worry, your existing drive will still be intact. Once you have booted from the SSD drive and verified its OK, shut down the computer unplug the SSD and re-start, it will boot to the original drive once again. You should now see your new 2TB disk in finder, the disk should be empty. Now we need to create a temporary account to unlock your profile so we can copy your home folder to the new drive. At this point you are ready to start the disk transplant process. You want to do the following things in order. 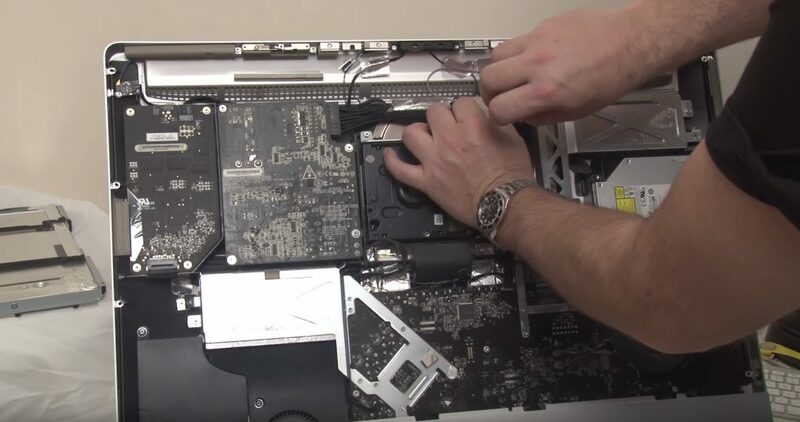 Install the SSD drive using double-sided sticky pads – make sure its well fixed, you do not want it coming loose as it will interfere withe air flow that cools the GPU – this will Kill your iMac!! If all has gone well you should have a fresh new OS and you should be logged in as administrator. The next thing we need to do is re-create the accounts and then re-locate their home directory. First of all you need to create a new account for each account you have re-located. In my case the account I relocated is “gerrysweeney”. So go into the System Preferences/Users & Groups tool, unlock it if needed, then create the new account. By default, this will create a new account home folder on the SSD, thats OK, we will need to deal with that next. If you have more than one account you have re-located, create a new corresponding account for each one. When you create the account, use the same password as your previous account, this way your keychain will remain accessible and valid once you re-instate your home folder. Now you have a new account with a new home folder on the SSD drive, the next thing is to modify that account and point it to the home folder you previously re-located. In my case the account was “gerrysweeney”. In the Users and Groups tool, press the “Ctrl” key and click on the account name, you should get a menu option called “Advanced Options…”, select this. The “Home Directory” field will be set to “/Users/gerrysweeney”, you should change this to “/Volumes/Users/gerrysweeney”. Again, do this for each account you have re-located. UPDATE: Having done this I realised that later on I still have to set up a symbolic link to the home folder which is a couple of steps below. In lights of that you can simply skip the above step of modifying the account properties to re-locate the home directory. Once the symbolic link is in place it will work without doing this. This command will change the ownership of every file in this folder, including the folder its self and all sub-folders and files. Now I am not sure this is exactly right, it is feasible there are system files that should be protected from the user but I don’t know – what I done worked OK so its pretty safe. In any case you need to do this for every account you have moved – remember to replace “gerrysweeney” with the right account name. Now you have given the right ownership to your files, we now have to deal with the fact that much of your existing configuration will be looking for profile and other content from /Users/gerrysweeney, and the way we deal with that is by creating a symbolic link. In the terminal window you should issue the following command to delete the newly created home folder on the SSD drive that we no longer need. The next thing we need to do is recover your applications. You have the option of simply re-installing them all but thats a right royal pain, I found this worked really well and mostly re-instated everything for me. Now with all that done, you should eject the original 1TB HDD using Finder and you should shutdown and re-start the computer. While re-booting you can unplug the Disk Copy Station, you should not need it any more. At this point you should be able to log in using your original account – in my case this was “gerrysweeney”. If everything worked out OK then you will now have a working system, your desktop, applications and settings should all be restored and in the same state as they were before you started. Set aside a day to do this, its a pain, there is a lot of fiddling around and there is a lot of waiting for stuff to copy. In the end though its a worthwhile mod that Apple does not want you to do. UPDATE: I had found this after I finished the article and Anton pointed out in the comments I should include this information because it is important. Thank you Anton. Following on from my review of the Keithley 2110, I tamper with the tamper-proof seal and open up the meter to see what was inside. While I am there I have a look at the build quality and the overall system architecture. Keithley have a long history of building quality test equipment and I thought it would be nice to see how the latest kit from Keithley stacks up to their past reputation. The meter is easy to get apart and is built really well, nice solid construction and really very difficult to fault – apart from the really poor LCD display. Please see the video for the details as they unfold. The PSION II was the worlds first PDA (Personal Digital Assistant) and was revolutionary in its time. In reality it was next to useless for most things but if you persisted you could store your contacts in it at a push. In this video I take it apart to have a look inside at that 80’s 8-bit computing excellence, break it and repair it along the way. The architecture is basically a simple 8-bit computer based on a Hitachi HD6301 CPU (now obsolete of course) which was a CMOS version of the now legendary 6800 microprocessor. The CPU running at just under 1MHz along with a couple of EPROMS and some SRAM make up the entire system, very simplistic by todays standards. The portability was made possible because of both the CMOS technology as well as surface mount components which were are relatively new innovation at the time. The system used Data Packs which at the time were quite expensive. A Data Pack is essentially an EPROM while a RAM pack is a battery backed SRAM chip. These packs are in small cartridges and the PSION II could have two cartridges loaded at any one time. When the Data Pack got full you had to remove the small board from the cartridge and expose the internal EPROM’s window to UV light – not sure how PSION got away with marketing this but I suppose at the time thats all that could be achieved for permanent storage in such a small package. This is a very hackable device but when all said and done – what would you use it for. The one thing it could be converted to is a portable EPROM programmer, that would not take much effort but EPROMS are not really much use now days. So with nostalgia set aside I cannot think of any sensible use for this (except donating to a computing museum perhaps) so its going into the garage on the “Of no earthly use but too nice to throw away/scrap”! I found some useful links on the web which describe the technical and user details of these machines which I have provided below. I have been using this Racal-Dana 1999 counter for a long time and in the last few months it started to suffer from an intermittent fault where it would appear to freeze and stop responding. Banging the unit on the side with the palm of my hand would get it going again, and when doing this it would often restart as if its been powered on. In addition to this fault, the counter suffers from an altogether common problem with the buttons on the front which loose any tactile feel to them and become difficult to actuate – this is a common problem on these counters and thats down to the poorly designed switches Racal used for its frequency counter range. I identify the fault and fix the problem and I replace all the buttons with ones that work and end up with a fully restored frequency counter once again. 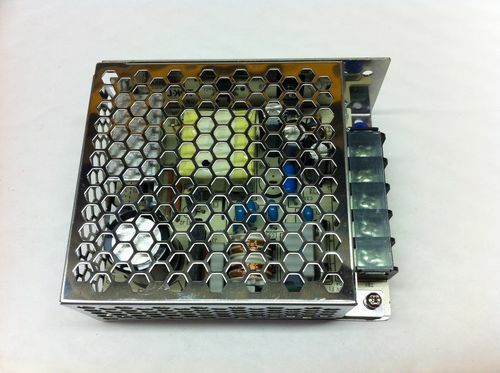 Having gotten myself a Rubidium Frequency Standard I found that the unit on its own is not that useful, its really just a component and needs really a supporting PSU and a decent enclosure to make it useful. I was searching around for something suitable when I was directed to a robust quality unit being sold on e-bay for just £20 with an unbelievable level of re-usable content and turned out to be an almost perfect solution to making the Rubidium Standard a useful Lab item. Rarely does such a fine marriage of junk bits come together to make something really useful? The original plan was to use the PIC for three functions, the first was to make the power LED flash while the RFS was warming up and on solid when locked. The second was to generate a 1 PPS signal from the 10Mhz signal and the third was to generate a PWM signal to control the fan speed. As it turns out the RFS already has a 1 PPS output on Pin 6 of the DB9 connector so there was no need for this. It also transpired that the only fan I had to hand was a three wire fixed speed fan, so I also did not need the PWM signal, this left me with just the power LED to deal with which is what the PIC ended up controlling. 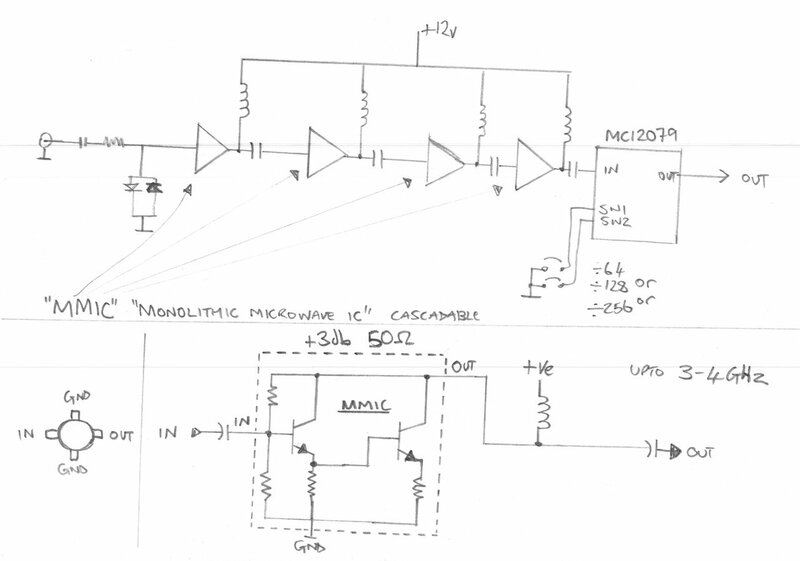 Here is the schematic for the PIC and the source code. // Using MPLAB-X and the XC8 compiler, both are free from Microchip.com. 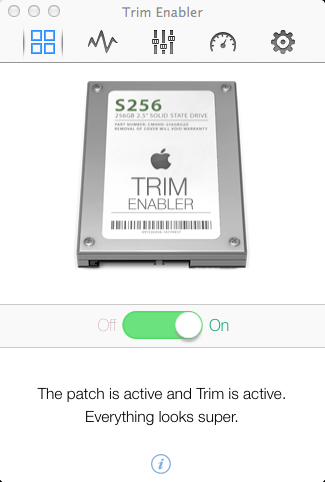 // I am using this on OSX (Mac) and with an ICD3 for programming. The video op amp chip used in this unit is a CLC409, the Texas Instruments CLC409 Data Sheet data sheet is attached to this article. 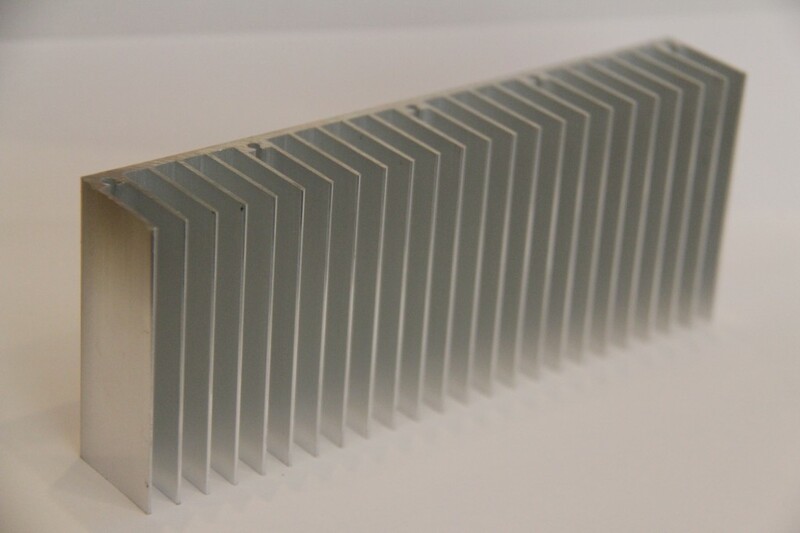 The heat sink I have ordered can be found on e-bay, search for “150x25x60mm Aluminum Heat Sink for LED”. Now as it turned out, when Andy constructed his own board he had enough components left over so also constructed and tested one for me which was a really kind thing to do and very unexpected too. In exchange for this I have insisted that I can build him an OCXO board while I am doing mine to return the favour. Anyways, I thought I would do a video to show the HP/Agilent 53131A-030 DIY 3GHz Cannel 3 Option board getting fitted to my counter. I also spend some time explaining how the pre-scaller circuit works and in basic terms what MMIC’s are and how they work too. 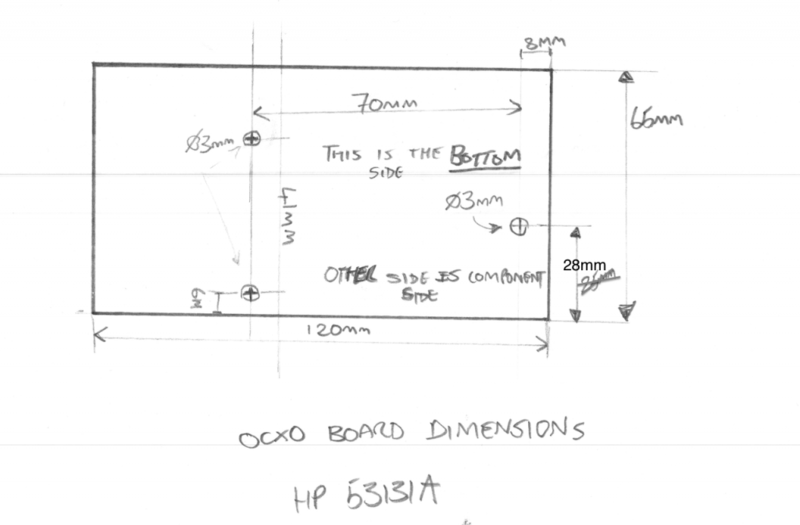 I also make an adaption to my previous hard power switch modification to make way for the upcoming DIY OCXO board, and I measure up to get the exact board dimensions and mounting hole positions I need for the OCXO PCB layout. The entire work and full attribution for the DIY 030 option board/PCB goes to Andy, so Andy – thank you so much for making one of these for me – I really appreciate it. PLEASE NOTE: I will not put Andy’s Youtube/EEVblog ID here unless he asks me to, and I will not pass on his details without his express permission so please don’t ask – I respect people’s privacy. If Andy does want to share his details in connection with this project then I will gladly put them here. 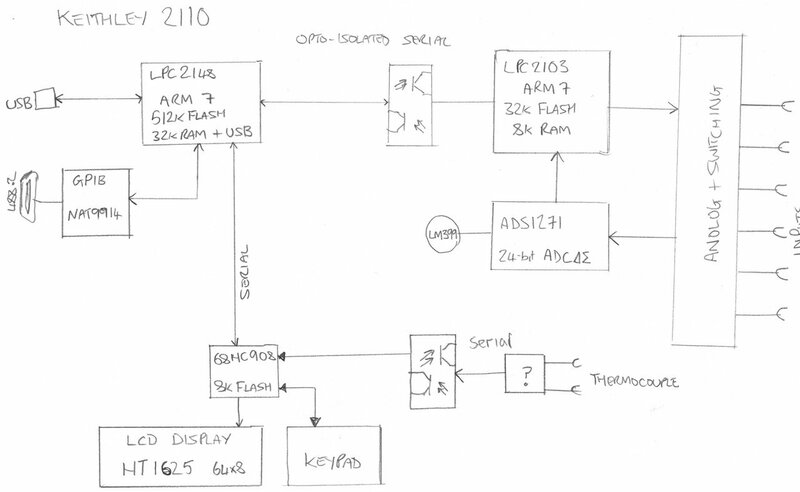 PLEASE ALSO NOTE: The schematic drawing below is technically incomplete and is meant as an illustrative block diagram. In the real circuit there is also a resistor in series with each inductor at the top of each MMIC to set up the right DC conditions.